One of my most favorite comfort foods is French toast. I just love it, especially on a cold, winter morning, or in some cases, a cold, winter evening for dinner! I don’t know who invented French toast – who would have thought to coat a slice of bread in raw eggs, milk and cinnamon and then fry it? – but I praise them! My own basic recipe for French toast is below. I usually pour some maple syrup over it, sometimes with bananas, if I have any. Sometimes I even caramelize the bananas. But last week, I had a heap of leftover salted butter caramel sauce from the popcorn ice cream I had made and wanted to do something special with, something that I could share with others. An idea suddenly popped into my head one night. I was craving French toast (which was not at all unusual for me!) and was thinking of ways I could jazz it up. How about caramel French toast? No… it would need a fruit to go with it… how about apples? 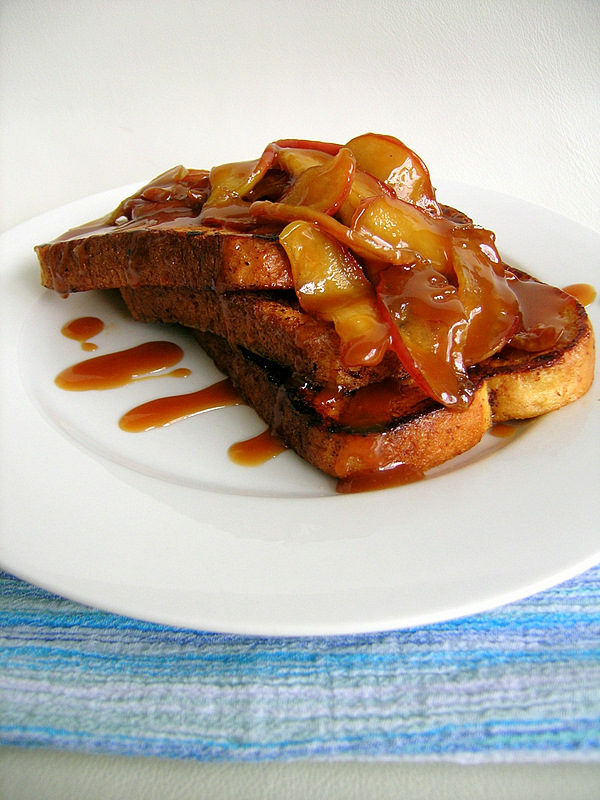 Yes, how about caramel apple French toast! And you know what? It was one of the best dishes I have ever eaten. It was so good, that I found myself making it again the very next day. Preparing the apples and French toast is easy; it’s the salted butter caramel sauce that could give some people a problem. The original recipe for the caramel sauce comes from David Lebovitz, and it can be found at Almost Bourdain, where I found the recipe for the popcorn ice cream with salted butter caramel sauce. It involves melting down 2 cups of sugar in a large Dutch oven, and cooking it until it becomes a dark caramel color. This wasn’t as easy I had thought it was. When I was making it, the edges of the sugar did not liquefy. I had to stir it a little bit, and noticed that the bottom of the sugar was very, very golden already, so I started stirring and eventually got it to a really beautiful caramel color – it took a while though. Next step is to take the melted sugar off the heat and stir in 1 2/3 cup heavy cream. Apparently it’s supposed to bubble up furiously, so be very cautious at this stage. But mine didn’t bubble at all! Instead, after I added it, the caramel became a huge sticky chunk. Hm, that’s not what was supposed to happen – I hoped that I hadn’t ruined it. I returned it to the heat, and continued to stir, stir and stir (my arm was so tired by the end of this!) to melt that chunk back down. And eventually it did melt down and I was so glad I hadn’t decided to throw it out! The sauce was very smooth at this point, and to finish it off, I added 2 tablespoons of butter and 1/4 teaspoon coarse sea salt (or you can use fleur de sel if you’re lucky enough to have it) and stirred until I had this gorgeous-looking, drool-worthy caramel sauce. It was simply to die for. So, when all that is done, you can keep the sauce in the refrigerator for up to one month. I had heaps leftover after the ice cream was all gone. For the French toast, you’ll need to thinly slice up half of a sweet apple, I used Pink Lady. But don’t slice them too thin, and you can peel the apple if you like (I didn’t). Fry the apple slices with a bit of the caramel sauce until they’re tender and a little bit transparent. Set aside, then make the French toast. You can use my way, or you can use your way, doesn’t matter to me! For my caramel apple French toast, I used a gourmet thick-sliced white bread. You can use any type of bread you like. French toast with caramelized applies and caramel sauce. A lovely, indulgent breakfast. Caramel sauce: Spread the sugar in an even layer in a large metal Dutch oven or casserole, at least 6 quarts (6 L). Set over moderate heat and cook without stirring, until the sugar near the edge just starts to liquefy. Continue to cook until the sugar turns deep brown and starts to smoke. (Don’t worry about any large chunks of caramel.) The darker you can cook the sugar without burning it, the better the final sauce will taste. It’s ready when it’s the colour of a well-worn centime, or penny, and will smell a bit smoky. Remove from heat and quickly stir in about a quarter of the cream. The mixture will bubble up furiously, so you may wish to wear an oven mitt over your stirring hand. Continued to whisk in the cream, stirring as you go to make sure it’s smooth. Stir in the butter and salt. Serve warm. If you like your sauce a bit thinner or less rich, add ¼ cup (60 ml) water. French toast: Prepare egg mixture for the French toast by placing eggs, milk, cinnamon and nutmeg in a bowl. Whisk until smooth. Pour into a shallow dish and set aside. Heat a frying pan over low-medium heat. Add about 1-2 teaspoons (just eyeball it) unsalted butter and let it melt. Add sliced apples and 1 tablespoon of the caramel sauce. Stir to melt caramel sauce and coat the apples. Cook the apples until tenter and a little bit transparent. Add 1 teaspoon or more of caramel sauce if the apples are looking dry. When done, remove from the pan and set aside (keep warm, if possible). 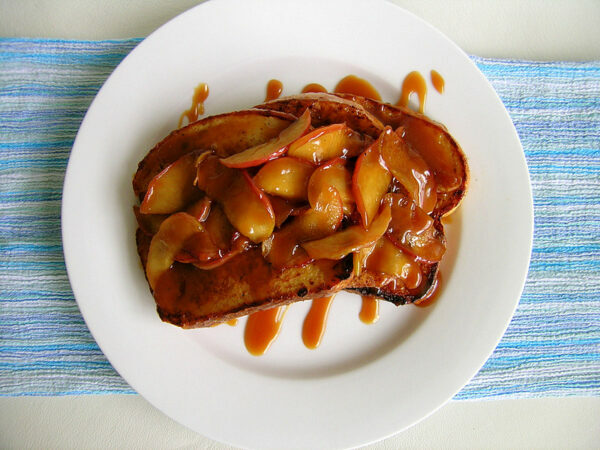 Do not clean the frying pan after cooking the apples – the cooked-on caramel will give a great flavor to at least your first batch of French toast. Keep the pan on the heat and increase the heat a little bit. Add 1-2 teaspoons (again, just eyeball it) of unsalted butter to the pan and let it melt. Coat a slice of bread on both sides in the egg mixture, then place into the frying pan. Cook until golden brown, about 2-3 minutes, then flip the bread over and cook the other side until golden brown. Repeat with the rest of the bread, adding more butter before you add more bread to the pan. You can cook two slices at a time or more, if your pan is big enough. Set aside the cooked slices and keep warm while you cook the rest of the bread. I like to add more cinnamon and nutmeg to my egg mixture after coating each slice of bread just to make sure the next slice has the same amount of spice! To serve, arrange French toast on a plate. Place caramel apples on top of the toast, then drizzle the whole pile with caramel sauce (not too much though, so it won’t be too rich!). You may need to heat the caramel sauce in the microwave to make it pourable, if it’s been in the refrigerator. Storage: The sauce can be made up to one month in advance and kept refrigerated. Rewarm the caramel in a small saucepan over low heat or in a microwave. That looks simply delish and sinful. I adore the caramel recipe. Oooh yum! I am also a big fan of french toast, although I don’t make it anywhere near enough as I should! The addition of the caramel apples looks so appealing and delicious, what a great brainwave! Holy goodness! I’d love the morning if I knew I had this to wake up to. Caramel sauce and apples were made in foodie heaven. 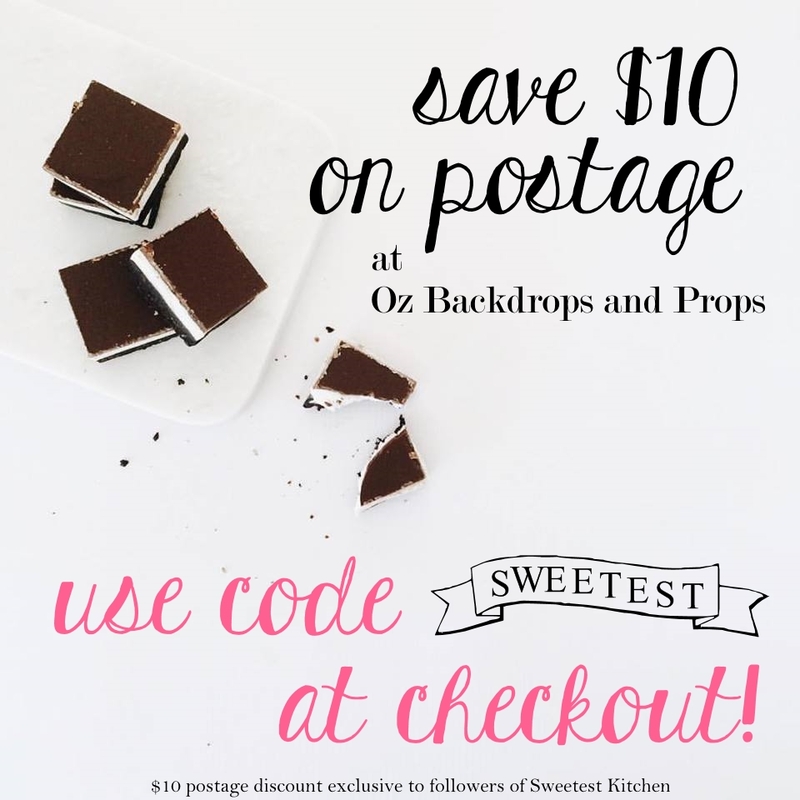 You’re proving out theory that there is nothing salted caramel doesn’t taste just amazing with! 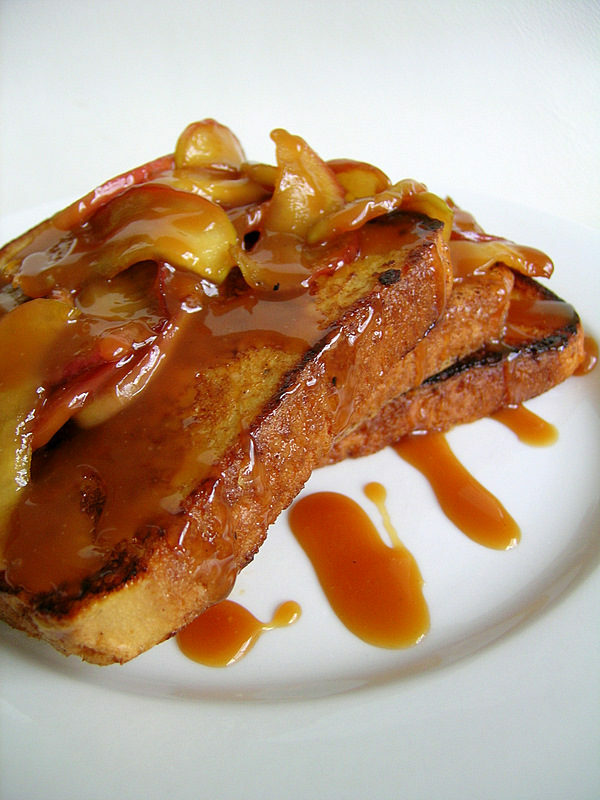 This is such a fabulous idea…french toast is hard to resist but caramel apple french toast looks totally impossible to resist!! This is a wonderful idea. I’ll take caramel sauce on anything. Any day. Jamieanne – that looks heavenly! This looks incredible! That is a decadent breakfast! hey, this looks awesome not a huge fan of apples though maybe i’ll go for bananas or pears. Anyway regarding the caramel, not bubbling up furiously could it be that you added cold heavy cream instead of room temperature heavy cream? Just testing out a theory. Let me know thank you!